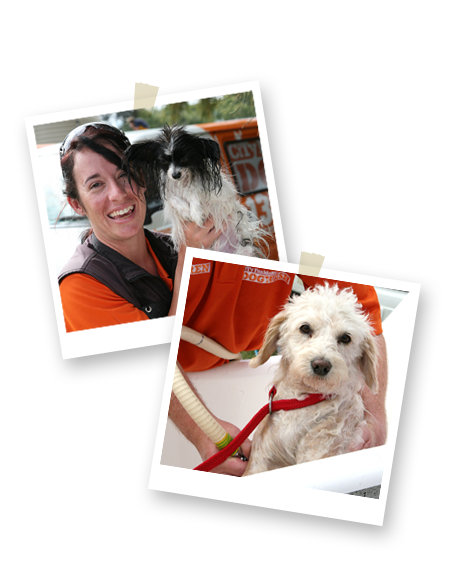 City Farmers Dogwash began back in 1993 with a husband and wife team and two team members operating four vans in Perth. Back then we were called Flea-Stoppers. Nearly 140 dog years later (that's 20 human years), we continue to provide the same highly personal, reliable and friendly dog wash service we’re known for, and more. Every dog is different. Different coats, different temperaments and different tastes in parasites. So we spend a little time sussing out our new client before we begin the scrubbing and pampering. Need some top pooch products? Our mobile units carry a great range of doggy essentials that can be ordered and delivered as part of your routine wash – or dropped off in case of emergencies! Whatever the reason, whether it’s fleas, ticks, dirt, general stinkiness, or you’ve just run out of dog food – give us a call and we’ll bound right over.